Tone 10 is the day of Manifestation. We can see what we’ve created from another point of view. What began as ideas, hopes or fears becomes physically present with the energy of Ten. Tone 10 reminds us of the Power of what we believe and the thoughts we focus on. Conscious or unconscious, our thoughts will manifest as our experience. This is a great Blessing, and also a great Responsibility. To create, we only have to Believe in a future we see in our imagination. To manifest anything we must experience it as the Truth. Crocodile/IMIX is the Dawn of a New Awakening, the Alpha, the Beginning, and the Day Sign of our Primordial Mother that was with us when we were born into our first realization of Consciousness. IMIX is the Day Sign of the Divine Feminine, holding the Power of Discernment, Consciousness, and Compassionate Love. In our first moments of Consciousness, our first likely questions were, Who Am I, Where Am I, and What is the Meaning and Purpose? Like a Divine Mother, IMIX shares the message that inspires us To Be. We can be anything we Dream of, exist in a world that We Create, and Discern our Reason for Being by the things that bring us Joy and Happiness. We hold the unlimited possibilities of our own imagination. IMIX is the womb of the Mother, the Creative Void from which all Creation is Drawn. On the Tone 10 of Manifestation, we’re positioned to draw into existence the Dream we Imagine. Beginning the 6th Uinal: Number 6 holds the Intention of Flow. The next 20 days will establish a rhythm and pattern of movement. The practice of employing our Faith will pay off by becoming second-nature. We can dream of a future when we turn to Spirit by instinct. The 6th Uinal intends for Dreaming and Believing to become second-nature, and the steps an Expression of our own Dance of Love. IMIX is the Day Sign of Innovation, capable to Awaken our own Genius. Known as the sign of Innovation, IMIX helps us use our mind in creative ways. IMIX is a Day Sign that speaks to us, like a Voice in the Womb. This is a day when we can receive “wild ideas” and imaginings that break through from “someplace else.” If we pay attention, we can tell these “wild ideas” aren’t our own, when they interrupt our own train of thought. On the day our New Consciousness is born, a Compassionate Mother speaks to us. This is an important day to keep a pen and paper close at hand. The ideas of IMIX are random thoughts that may seen to be unrelated. They may take on greater meaning after the day is over and they are all seen together. Or, they may be the springboard for our own Dream of the future. They are thoughts without form, Divine Inspiration, that raise our Consciousness to the most important Gift of the Creator, the Gift of Choice. We receive the Inspiration to Know who we are, given the Gifts that would be shared with a Divine Creator… the Consciousness to Discern, the Imagination to Dream, and the Divine Inspiration for the Manifestation of our first Dream. The ideas are random on purpose, so that whatever we Choose will be our Own Creation, defined by our own Spark of Genius. The Crocodile is territorial and a fierce protector of its young, working hard to provide the safe place for its family to become. IMIX is a source of nurturing energy that takes on the duty of Motherhood, responsible for the Care and Nourishment of its young. IMIX feeds our thoughts and establishes an environment where we are Free to Dream. Free of our Fear for Survival, IMIX encourages a Dream that is born outside the Mind of Reason. We are given a Choice that is Free from the Consideration of its Possibility, Free from the thoughts of whether we Can or we Can’t. IMIX teaches us that the more important question is What Would We Love? The primary assignment of a Mother of a Creator is to connect us to our Passion. We can Create Anything from the realm of our Imagination. We must be protectors of our own thoughts, for the reality we Imagine will be drawn from the Void. This is a day to focus on Dreams we Love the Most. Love holds the Power to transform thoughts into Pure Genius. IMIX can help redirect our thoughts from the world around us. The “wild ideas” presented by IMIX will be much more interesting to think about than the thoughts drawn from the world. Like a Mother that comforts her child with a lullaby, the song draws our thoughts away from our feelings of discomfort or vulnerability. We can manifest the Peace that we focus on. Our responsibility under the Tone 10 of Manifestation is that we must Claim what we have created. Just as we were born with our own Spiritual Gifts, they are not ours to use until we realize they exist. Those born with the talent of a Master Pianist are unaware of the Gift until their hands are drawn to the keys. We could compare this Manifestation of IMIX as the day we played our first song, the day we first realized our own Genius. We were conceived by Sun/AHAU, the Divine Masculine and Supreme Creator. AHAU inspired the Human Will to employ the gifts we are given. A Divine Father guided us to Know the most important thing we could ever do is to share the Spark of Love that was seeded in our Heart. AHAU believes in us, knows what we are capable to do, and motivates us to make this Love our Mission. At birth, our most vulnerable and magical day, the Father returns us to the arms of our Mother who would encourages us with songs of how beautiful we are. On Tone 10, we’re given the Gift of Seeing it for ourselves in our Imagination. She would encourage that there will be plenty of time to Create and Manifest all our Dreams. She inspires us to take the time to Play in our Imagination where we will Conceive our own Dream. 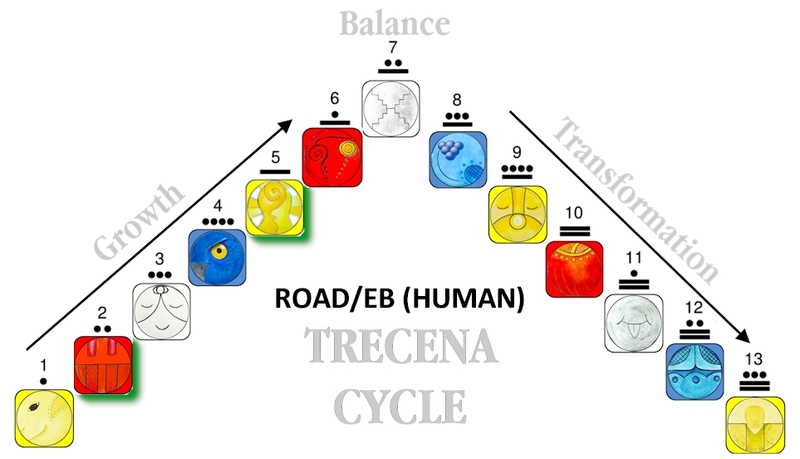 The Road/EB trecena is offering the Wisdom of an Experience of Creating our Reality. The Journey that leads to our Divine Destiny is unaffected by worldly influence, created Wholly from what we Imagine our world to be. Road/EB has helped us see the Power of the Love we hold within. The reality of our experience has shown us that our Darkest Hour is only the last moment of turning away from the Light. Our own darkest hours are the moments we are drawn to turn to the Light. All our suffering could be ended by realizing this Truth. We could face our own darkness with Hope. We could change our mind to see this Darkness reflecting the Power of the Light that will overcome it. We could imagine the Divine Justice that would outshine even this darkness in the Future. The darkness we see in the world is only a temporal illusion. It would be a shame to claim it as eternity. If we look more closely, we could see that Light was created as the experience we would know when we are awake and conscious. We were created to Dream in the darkness, unbridled dreams, free of any correspondence with our worldly reality. We can imagine the Dream that was inspired the first time we opened our eyes. After spending so much time in Darkness, our eyes were opened to a new world of Light, Colors, and Beauty we would experience through all of our senses. Instead of existing as One in the Womb, we had our first experience of being Loved, Held by Choice, and drawn close by an Intention of Love. This was our first inspiration for the Love we would Create. Today we are offered an Awakening to the Choice we are Given. We can realize that Happiness is a choice. We can realize that regardless of the illusions and fears presented by the world, we’re Happy anyway. When I began a journal I existed in darkness without hope. From a mind of reason, all the circumstances of my life were seen as insurmountable roadblocks to my own happiness. I was convinced that I couldn’t be happy until these circumstances were changed. I’d held hope as long as I could that tomorrow would be a better day. As the reality of my own time on Earth set in at 64, I was lost believing that the time necessary for these changes, would leave no time to enjoy it. It was too late for me to enjoy any happiness tomorrow. All the prayers in the world couldn’t save me from this Dark Dream. I thought my life might as well be over, if even the Spiritual Teachings of a lifetime couldn’t save me. I manifested the Dark Night of my Soul. It was the last thing on my mind every night when I went to sleep, and the waking nightmare every morning. I kept waiting for a direction, but could never see it. There was no Divine Discernment of an Answer. Little did I know that this Darkness could generate my Passion. In a last ditch effort of Happiness, I did the only thing I could Discern to do. I established a Daily Practice of writing in my journal. I would listen to what Spirit might share and record the Inspiration of each day. I went so far as to create my own Angel Doll to sleep with, giving it an Intention to guard my thoughts through the night. My waking nightmares were surrendered into Divine Hands. I called on my Higher Self to take over so I might go on. These were my moments of turning to the Light of a new Dawn. The waking nightmares were the first to go. I was given the gift of starting my day in the Light instead of the Dark. The Light grew brighter with every day, until one day I realized I was Happy for no worldly reason. I experienced a Peace beyond understanding and a new hope for the future. This first turning began in September 2014. I was inspired by Minisa Crumbo’s book, “Spirit Talk, a Count of Days,” a daily journal of her Communion with Spirit. As 1 Wind/IK, Minisa holds the Power to Disseminate Divine Ideas. As a friend, Minisa encouraged me to keep my own journal. It was hit and miss in the beginning, disorganized writings – some in a journal, some on disconnected papers, and others created on the computer. The effort was far from perfect, though it led me in a Divine Direction. In October 2015 I committed myself to journal every day of the 260-day Tzolk’in round, beginning on 8 Monkey/CHUEN (8 B’atz) the K’iche Maya New Year. It was a personal challenged that reached beyond my Faith in myself. Writing my thoughts for the world to see, I was too fearful to sign my name or even include a picture. What would people think of me? What if people at work saw it? What if I failed? I had so many reasons why it was wrong to be me. I still have some dark hours, but it makes less sense to suffer when I know a Joy is waiting when I turn around. My darkness has served a Divine Purpose. Today is a day for Dreaming more than Doing, Dreaming without the need to figure it out. IMIX inspires us through our Imagination to discover what we would Love, and to Believe that Love is all we need to manifest the Dream. The Gift we can Claim today is the Power of Love we Believe in. Tone 10 intends for us to manifest a Dream. IMIX can present an experience we’ve faced in the past along with a realization that we are seeing it in a wholly new way. It could be something we were once afraid of, that no longer returns the same response. It could be like the day a musical savant first sat down at a piano and realized they could play. The 260-days represents the Human cycle of gestation. Just as the Earth has its completion cycle of 365 days, the Maya recognized Human’s completion cycle as 260-days, celebrating birthdays every 260 days, marked as major milestones of transformation. 10 IMIX is helping us mark a Major Transformation. Moving into the 6th Uinal, we can claim the Momentum of Transformation into a Rhythm and Flow of Spirit. This is a day made for our Biggest Dreams. The Bigger and Better they are, the more we Love them, and the more capable we are to manifest their creation. They will be inspired by a “wild idea” and a Leap of Faith. I had no idea that my “last ditch effort” was Divine Inspiration. I thought I was just moving in the only direction I knew to take. I didn’t heard it as The Voice, but I remember the message. Investing myself wholly in a Divine Effort was the only way I could know I’d done everything I knew to do. All we need to pave the road to a new destiny is a single idea. It can be a random thought or the only direction we know to take, without knowing where it might lead us. It could be more fun not knowing where it will lead, so Surprises and Miracles can happen along the way. To all my relations, may our eyes be opened to Light, Color, Sound, and the Experiences of Spirit that foretell a Dream being manifested in the future. May we claim that the Dream is all we need to be happy. May we allow ourselves to be children again, creating Dreams in our Imagination, and Believing they are True. May we claim the Gifts of Imagining and Believing from IMIX, and the Gifts of Will and Determination from Sun/AHAU. May we claim these Gifts were given to serve us from the Beginning to the End. May we claim that we are positioned in the perfect Time and Place, not too early, not too late, nor lost to a place where the Dream can’t come True. May we Believe in the Divine Justice of the Creator, who offers us an Eternity to experience the Joy of its Manifestation. May we claim that the only way we know to turn is the Discernment of a Divine Direction. May we celebrate our Awakening as a new Birthday of Spirit, and claim our Freedom from the suffering of the world. I’m grateful that we have so many chances to start over again. Cherokee Turtle/ DAK’SI I’SB: Turtle Island; direction East. The Turtle Constellation Orion, one of three stars in the Cosmic Egg. In Mayan is the Cosmic Hearth. Turtle is the Energy of Creative force at the one-on-one, personal level; dawn, awakening, birth. The beginning of each new era, this star in Orion appears with the rising Sun, heralding the creation of a new World cycle. Cherokee, IMIX- Totem-Dragon. The energy to understand all things sacred; creation energy, connection for visions, to learn the mysteries of the Universal Knowledge. The dragon carries the source energy of life, revered in ancient cultures for power and wisdom. Thank you for this particular message today, Debra. I’m in the midst of a very challenging period of time, as one of my cats has cancer in her mouth and does not appear to have much longer to radiant the amazing light that she emanates. Your words have brought light into my heart and I will now go give as much of that light to her as I can. Thank you, Debra…we both appreciate your prayers, love, and energy. Have a peaceful day.